Are you on the lookout for new and innovative tools for your business online? Are you concerned about the prompt delivery of product and tools to your work site? Are you searching for inventory control for sites and stock room? Purchasing tools and equipment for a business is perhaps the most significant task manufacturers, and entrepreneurs have to face. It also happens to be a decision that can favorably or adversely affect the overall progress of your business. Investing a huge amount of capital in purchasing these fixed assets can be a very stressful task that demands an entrepreneur’s full attention and assessment. Most of the purchases of hand tools, cutting tools and equipment are usually made online. Why buy online? It is a good idea because of the availability of various innovative and different products online on different websites. Instead of trudging down different shops, auction and yards, a website full of different deals, on site delivery of tools, repair services, etc are a better choice. Entrepreneurs ensure that they make the wise and right purchase from a trusted source and also make comparisons carefully, ensuring the long-term value of every tool you are buying. 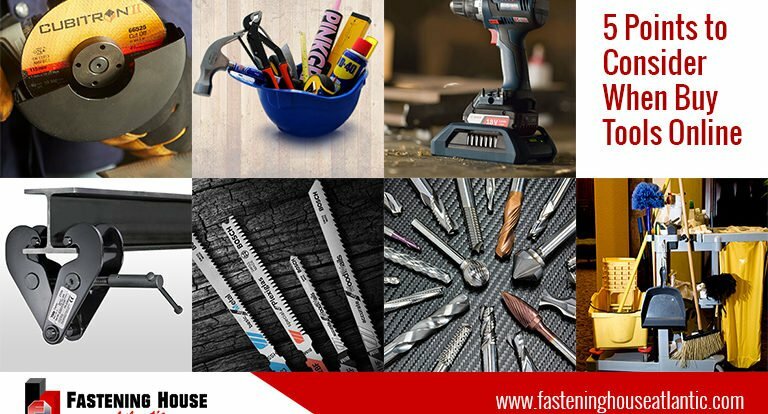 Fastening House Atlantic is adamant to help you make the right choice while buying tools online. We offer you a wide range of different tools and products at the most reasonable rates and best services, all under one roof. We deliver you, your products duly on your construction sites without any delays with service warranty. Our tool repairs and construction site services have are trusted upon by many manufacturers. These 5 pointers formulated by our experts will act as a guideline to help you carry out the right purchases. You need to know what you will be shopping for. It is very vital that you make a list of all the tools and equipment you will be needing. Ensure that this list should meet your business plans. You can edit, shortlist or upgrade this list of needed tools as you go on with your business plans. It is advised that you split the list into two sections. One section can be dedicated to the hard tools and equipment you must purchase for routine operations while the other section can be a “wish list”; list of tools that are not necessary, that you can buy if you have excess funds. By making this dual checklist, you will be spared from making some unnecessary purchases and can get your hands on the tools that are actually imperative for the business. 2) The right online supplier: Who are you purchasing tools from? Make sure your supplier is a trusted source, and they have a fair record of dealings. While buying tools online, it is essential to steer clear of any fraudulent suppliers. Carefully examine the website, the terms, and conditions, etc. Fastening House Atlantic is locally owned and operated company and is the sole provider in the Maritime Provinces that specializes in serving and meeting construction/industrial needs (including electrical, mechanical, general contractors, and subcontractors. We have complete range of products and offer one stop solution to all your construction supplies. Fastening House Atlantic has a well established and satisfied client base in tools repair, site delivery, product training, inventory control system and inspection and repair services. We make sure we deliver you the right tools for the right task! Are you buying tools for your office, restaurant, retail business or factory? You must make the precise measurements of work space before buying any tools. Some tools may seem great in the picture online, but it will be an unwise investment if your work space is too small to accommodate it! This consideration will help you from attempting costly mistakes. It is not wise splurging on tools you cant even fit into your work space. 4) Brand new tools or used tools? Every manufacturer or entrepreneur will want to purchase brand new tools for their business, but it is impractical when you are on a limited budget with fewer funds for investments. While shopping online, you are tempted to buy everything new. Take some time out to evaluate the areas where buying new tools is a necessity and while making use of “gently used” old tools may be wise. It will help you wave off some substantial capital expenditures. Many online sites usually have a lot of deals for this. Do not get overwhelmed by a “real deal” online. It will get you into the loss if the parts are easily breakable or not up to operational needs. While price will always play a dominate role while shopping online, you should always focus on better quality that brings in good value for money. If you run into some good deal online, take some time out to research what is constitutes of and how good are the parts.